Working with a cross-functional group, I helped us evolve an agile, user-centered process that incorporated multiple research, design thinking and rapid prototyping methods. 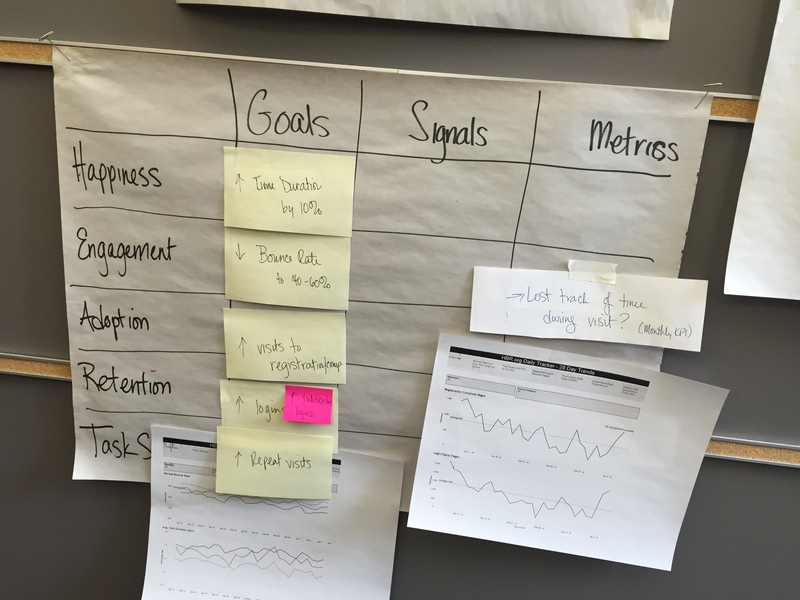 I also helped the team align on strategic goals, structures for JIRA tickets, and a set of UX benchmarking metrics. 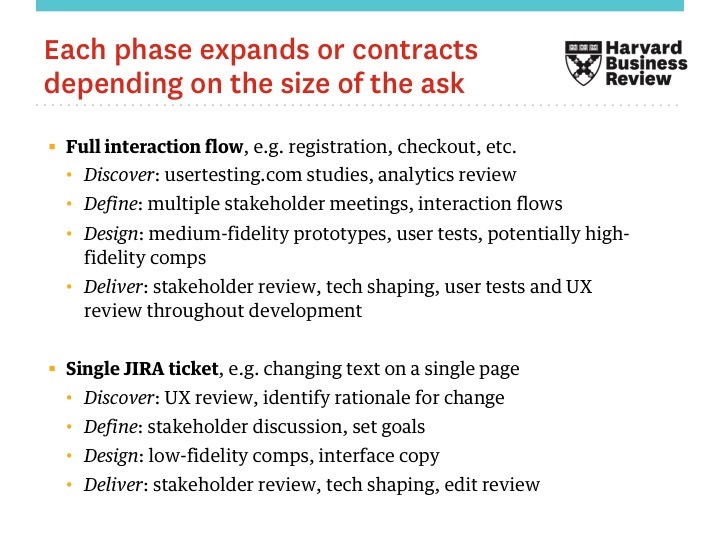 During my time at Harvard Business Review, I helped them improve the UX maturity of the product organization, introduced new processes for evaluative and formative research, and helped create artifacts that would help the team bring a user-centered approach to their work. These included usability tests, user journeys and personas, as well as strategy documents, goal-setting exercises, and enhancements to the organization's Pattern Library. 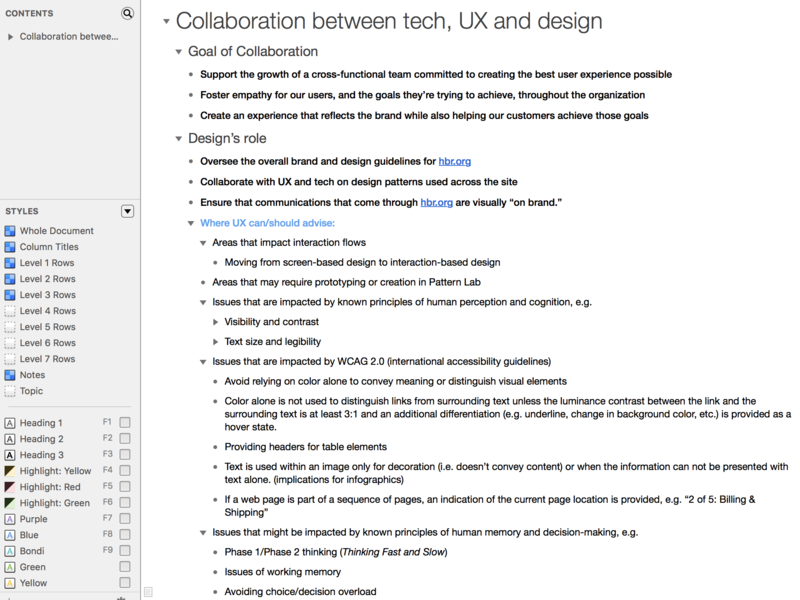 As part of the redesign of HBR.org, the team had come up with a series of user-centered tenets to guide their work. However, without a dedicated UX role on the team, they had struggled to balance those concerns with the realities of an Agile workflow. One of my primary responsibilities was to help the team come up with lean, yet rigorous ways to incorporate UX into their workflow. 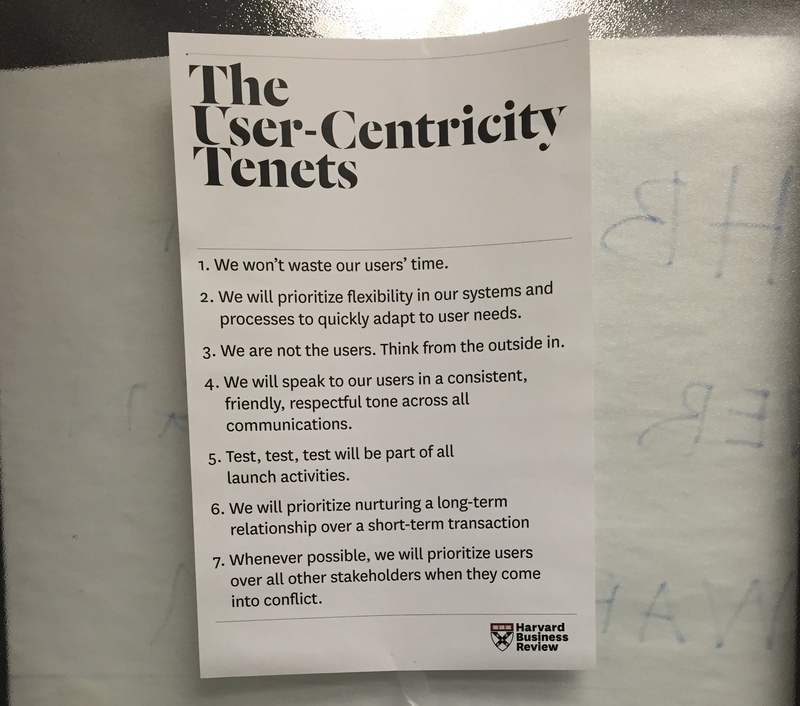 A set of user-centricity tenets was the catalyst for a new design strategy. When I arrived at HBR, I focused first of all on understanding the culture. I met with team members from Editorial, Marketing and Product, as well as the designers and front-end developers that I would be collaborating most closely with. I also took a look at the work that had been done during the time before I arrived, including the deliverables put together by the design team, the JIRA backlog, and old usability test sessions on UserTesting.com. By the end of my first 60 days or so, I put together a presentation of my findings and recommendations for my manager, to give him some insight into the direction I thought we should take. One of the exercises I used to help us prioritize was the HEART framework, by Google Ventures. The first step was to start a regular cadence of design research and validation, which included usability testing, first-click testing and qualitative A/B tests via Zurb Verify (now Helio). In addition to planning and running usability tests, I also created a partnership with Bentley's Human Factors program to sponsor usability testing and Field Methods courses, enabling us to get more structured usability testing and field research. By using a first-click A/B test, we were able to make the case for moving a promotional bar to a different spot on the screen, allowing the team to fix a major usability issue on mobile devices. Next, I worked with the design and engineering teams to establish standards for how we deliver design documentation for different use cases. 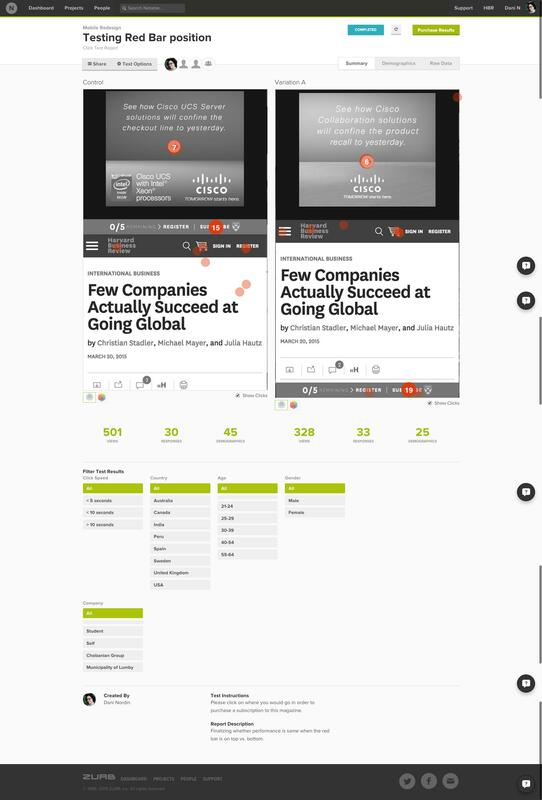 For larger redesigns and usability testing, we focused on creating responsive prototypes in Axure. For smaller iterations, we would provide annotated screenshots or smaller comps. For certain cases, like iterations to text or spacing, I would use Chrome's Inspect feature to edit the code manually, and provide screenshots and code examples within the JIRA ticket. As time progressed, we realized that the process needed to be clarified and documented so we could work together efficiently. 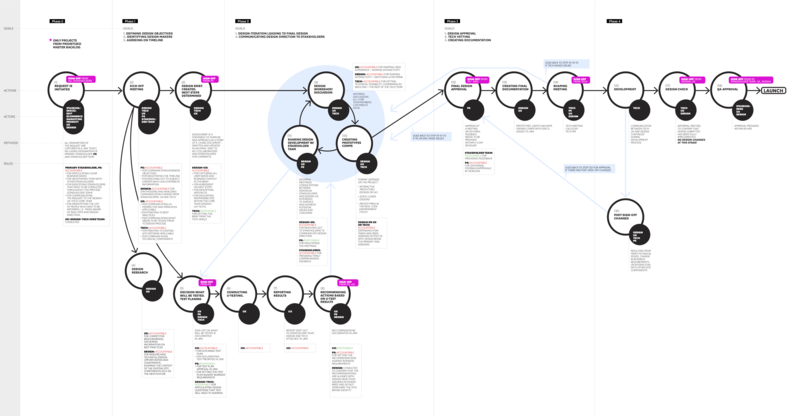 Working with the head of Product and members of the design, PM and engineering teams, we started to formalize distinct roles for research, design and prototyping, establishing guidelines for when we would use which method, and documenting the overall design process for hbr.org. As we moved further along our UX journey, I worked with the team to establish a framework for when UX needed to step in on a project. One of the lead designers documented our brainstorming sessions in a comprehensive workflow for the UX/design process. Taught and mentored designers on information design, Axure prototyping and usability testing.